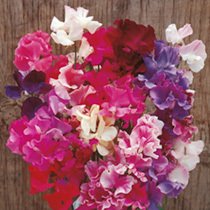 Probably the widest range of colours, flower forms, patterns and flowering times available! What's more, the fragrance is sublime. Has a much longer flowering period than normal mixtures. Scent Key - 3 (high scent). Height 1.8m (6'). Easy to grow. HHA/HA - Half hardy annual/Hardy annual. Tall growing variety - supports will be required in the form of trellis,sticks, canes or wire netting. A stunning addition to any garden, sweet pea flowers demand to be picked - and with so many having such a sweet scent who could resist?